World of 7 Billion Student Video Contest aims to influence public policies, attitudes, and behavior on national and global population issues and related concerns. 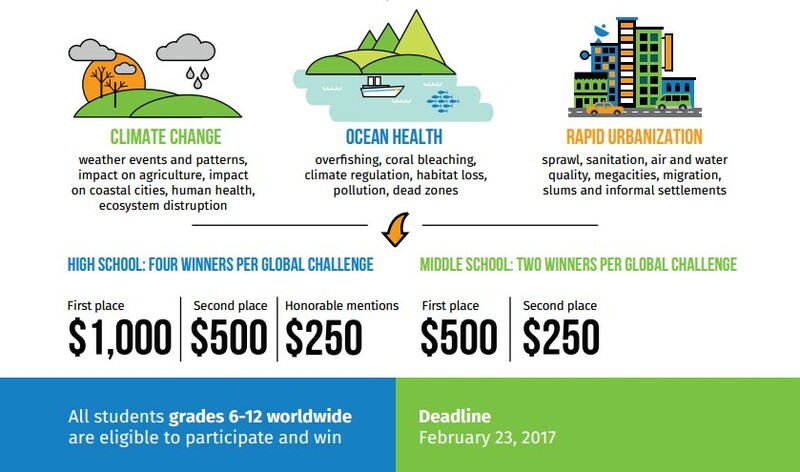 →All middle school and high school students are eligible to enter the 5th Edition of the competition. → Keeping in mind the interdependence of people and the planet, create a short (60 seconds or less) video that shows the connection between population growth and one of the global challenge mentioned below as themes. → Students may be located anywhere in the world. → Any high school student (grade 9th - 12th or its international equivalent) is free to enter. → There are no paper forms needed to enter a video. → If your video is chosen as a finalist, you will need to submit a signed Parent Permission Form and a signed Actor Release Form (for each person who appears in your video). → Finalist videos CANNOT be awarded a prize unless the necessary forms are received. Does the video follow the guidelines? 35% Content Clarity: Does the video clearly make the connection between population and the chosen topic? 35% Memorable/Interesting -How well does the video draw in the listener and keep their attention? 20% Creativity: Is the video original and something we haven’t seen before? 10% Production: What is the overall quality of production (including visual and sound elements)?